Oron Shaul and Hadar Goldin were declared dead by the IDF, but with Hamas still holding their bodies their families live with daily agony. (JTA) One family lost their son in late July 2014. The other lost theirs on the first of August in the same year. One family has lobbied the United Nations and crossed an ocean in hopes of bringing their son's remains back. The other mostly stays home. One family is sure their son is dead. The other is plagued by uncertainty. But one thing unites the Goldin and Shaul families: Of the 67 sets of Israeli parents who lost sons in the Gaza War two years ago, only theirs have not returned. "They say we're not normal," said Leah Goldin. "We have to talk about the first of August. It's like returning to the scene of the crime. We can't leave the place of our mourning." Oron Shaul, then 20, was engaged with his unit in a brutal battle over the Gaza City neighborhood of Shejaiya on July 20, 2014. He had left his armored personnel carrier to repair a broken part when Hamas terrorists began firing on the vehicle, taking him prisoner. Five days later, the Israel Defense Forces confirmed that he had died based on evidence at the scene. The battle claimed 12 other Israeli soldiers. Herzl Shaul accepts the army's conclusion about his son. But because his body wasn't recovered, Zehava Shaul believes he is still alive. She says Oron is being held captive by Hamas like Gilad Shalit, the soldier captured in a 2006 raid and returned in a hotly debated 2011 prisoner swap that saw 1,000 Palestinian prisoners go free. About two weeks after Shaul’s capture, Hadar Goldin was taken during the collapse of a cease-fire. In response, the IDF employed the controversial Hannibal Directive, which calls for the army to use any means necessary to ensure a soldier isn’t taken prisoner. Some 150 terrorists and three Israelis died in the ensuing fight. The IDF was able to recover enough of Hadar’s body to declare him dead. The family held a funeral, and since then has engaged in an unending quest to return the rest of their son’s remains. Though both parents work, the Goldins' campaign takes up all their energy. They have traveled from their home in this central Israeli city to the United States three times in their so-far failed attempt to meet with U.N. Secretary-General Ban Ki-moon and lobby for the return of Hadar’s body. They hope for a deal to increase humanitarian assistance to Gaza in return for the bodies of their son and Oron Shaul. They confer on the campaign regularly with the Shaul family. Back home, the Goldins and their friends are doing everything they can to keep their son’s memory alive. They held an exhibit of his artwork on the war’s first anniversary at the Ein Hod artists' village in northern Israel. Twice a year, his classmates organize a day of hiking and study in his memory. Following Oron’s capture, the IDF offered a headstone for him in a section of a military cemetery reserved for missing soldiers. The Shauls wanted no part of it. Oron has been memorialized at no shortage of events -- from official military functions to a marathon to a home match of his favorite soccer team, Beitar Jerusalem. An hour after speaking to JTA at their home, the Shauls would be visited by former Education Minister Shai Piron. But while the Shauls appreciate the thought behind these gestures, they are exhausted by them. Zehava Shaul doesn’t want to see her son memorialized; she wants him back. Besides, she doesn’t think he’s dead. Before last year, says Zehava Shaul, it “didn’t occur to us” to join the Goldins’ overseas trips. Zehava Shaul traveled to London last summer to meet with representatives from the International Committee of the Red Cross, to no avail. They planned to join the most recent trip, in February, but Herzl Shaul was diagnosed with intestinal cancer. Neither Shaul works now. They spend their days on the couches in the living room of their home in Poriya Ilit, a small town near the Sea of Galilee, surrounded by pictures of their son in and out of uniform, tortured by what might have happened to him. Oron’s bed is covered with signs, pictures and gifts sent to the family after his death. Otherwise it remains untouched, his shirts and jeans still sitting in neat stacks in his closet. Both families have met with Prime Minister Binyamin Netanyahu. But nearly two years after the war, neither expects much of him or finds comfort in his sympathy. They understand that after the Shalit deal, which saw many of the Palestinian terrorists return to terror, the Israeli public has little appetite for another exchange. As much as they’re campaigning to get their sons back, the Goldins and Shauls are fighting for something more basic: They just want Israelis to pay attention to their plight. "When we start talking about bringing back Hadar, they say, 'Oy oy oy, how much will it cost? 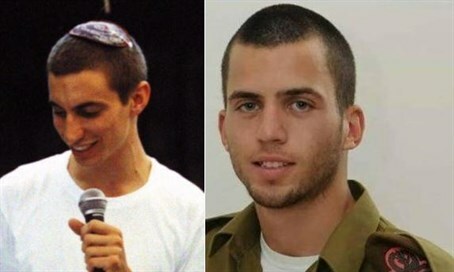 The trauma of Gilad Shalit was terrible for us,'" said Leah Goldin. "So what?" she asked. "You don't do anything?"